Ouspensky’s exercise of trying to be present uninterruptedly for two minutes showed us our multiplicity. All writers verified that their chief difficulty with this exercise lay in the thoughts, sensations and emotions that opposed it. We verified that we are not unified, that is to say, that we have no single ‘I’ that holds aims. We saw that our ability to hold even the simplest aim is challenged, not by external interruptions, but by ourselves. In the coming posts, we will explore this ‘beginning’. We will draw from the ‘beginning’ of Judeo-Christianity as expressed in the Biblical story of creation. Rather than take it as a religious account of how the universe was created, we will view it as a metaphorical description of how a cosmos transitions from multiplicity to unity, and in particular, how the transition applies to the micro-cosmos man. Readers need not be concerned if they aren’t familiar with this Biblical episode. I will make mention of each detail necessary for our comparison and support it with visual illustrations. Furthermore, we will leave aside the question of what ‘God’ means to the end of this series of posts. “The earth in chaos” signifies a cosmos in disorganization. In the micro-cosmos man, these are the many ‘I’s that appear and disappear randomly. This chaotic state is reinforced by self-ignorance, because sleeping man is unable to see his multiplicity, which is described as “darkness”. 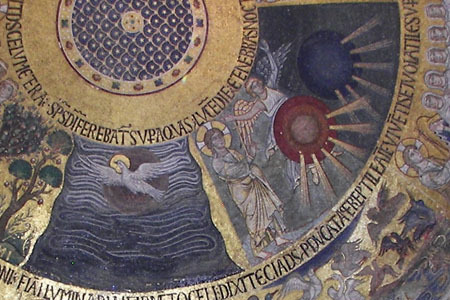 The San Marco mosaics portray this chaotic darkness as blue watery waves. Man could never rise out of this chaos if there weren’t something in him desirous of changing. 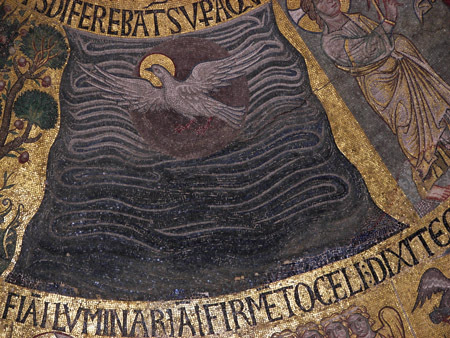 This desire is represented by the ‘spirit of God,’ which the mosaics portray as a white dove with a golden halo. Sleep has degrees. In the deepest sleep, we are unaware of our sleep. Therefore, the beginning of awakening must be the realization of sleep. This realization throws a ray of light onto our inner world, which is precisely what happens when formulate the aim to be present. Indeed, Ouspensky’s exercise invited us to turn on the light of self-observation. Taken as a metaphor for our own micro-cosmos, the beginning of the Biblical creation describes two distinct states: the first, in which we are ignorantly asleep; and the second, in which the light of self-observation reveals that sleep. Many consider this first step to be the most difficult. How can we remember to turn on the light if we have forgotten that we’re in the dark? Our work becomes a tug of war between forgetfulness and remembering, which is the origin of the Fourth Way term: self-remembering. So this month’s question to my writers is: What turns on the light of self-observation? What reminds you when have forgotten?